If you’re planning to visit for dinner, on a weekend, on a sunny day (or, heaven forbid, a combination of the three! ), expect to wait in a line that often hangs out the door. Despite the fact that seating is available not only in the main “restaurant” as you walk in but also the little alcove area to the right, upstairs seating above the kitchen and a courtyard out to the left, it is ALWAYS packed, which speaks pretty highly to the quality of the food being served up in an area with other seriously good options. The main menu had remained relatively the same over the last six or seven years I’ve been visiting, but my most recent visit, last weekend, showed some big changes. My previous favourite dish, the falafel roti wrap, was gone. I was upset. Really, really upset. You know when you go to a place just to eat a specific dish? Yeah, that was my dish. For under $10, you were facing a golden slab of roti bread filled with crispy shelled falafel that are some of the best I’ve had, as well as hommus, tzatziki, lettuce, tomato, cucumber and beetroot curls (below left). It’s been replaced with a falafel pita bread thing (right). It was basically the same thing, but the roti had been replaced with a soft pita bread (nice, actually), and the falafels were different. Spicier. Didn’t enjoy that part. It was nice, but I liked the old one better! The recent visit also saw us order another old favourite – the rice balls with satay sauce. These had also changed – they were bigger and better! Brown rice balls of deliciousness with a crunchy shell, much more flavour than the last time I had them there pre-change, and still the best satay sauce going around. Husband also got the lentil burger, drenched with more satay sauce. Messy, but good – however, he also preferred the old version of the burger. And just because it’s a “vegie” place, doesn’t mean you should skip dessert. These guys make two of my favourite desserts in Melbourne – their flourless chocolate cake and raw berry cheesecake. Beyond amazing, nothing different there, and absolutely enormous – bring your appetite, and bring a friend with an appetite, too. 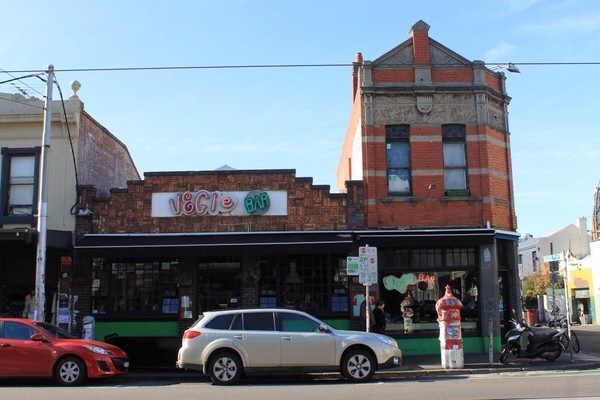 I’ve been eating at Vegie Bar for years now, as have a truckload of other people. The waiting for a table, sitting elbow-to-elbow with strangers, occasional mistake in getting the wrong order because it’s so damn chaotic are sometimes frustrating but have always been bearable because the food has always been so good. I wasn’t overly thrilled with the changes from this last visit, but I also recognise that not everything had changed, and that sometimes some changes are necessary. I’m looking forward to another visit, to try some other old favourites on the menu, and to see what else has changed! ← Roman dining – one of the best meals of my life! The food looks fantastic. I’m not sure if it is just your fabulous photos or fantastic food or a combination thereof. I wish this happy place wasn’t on the other side of the planet! Hehe thanks Sue – the food there is particularly photogenic! Haha my husband is the same! Hopefully you guys find some new menu items you enjoy too!